Can we all agree after 8 years of trying to recover from the poor image created by the Bush administration, it only took one visit to Europe from Donald Trump to destroy the nation’s reputation? Can we all agree Mr. Trump’s visit to NATO, not only showed his poor understanding of how the alliance works but his childish attitude in elbowing a fellow leader out of the way to get to the front row of a photo op? Can we all agree the Europeans seem to have changed Mr. Trump’s views on climate change, but it’s doubtful his EPA chief will change course? Can we all agree trying to make sense of the administration’s policy on immigration gets tougher by the week? 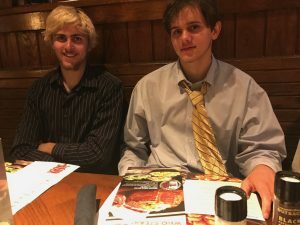 Jack, the graduate (right) and his big brother, Cole, at the post-graduation dinner. Can we all agree if the Senate and FBI probe of Russian influence is indeed focused on Jared Kushner, Mr. Trump is in deep trouble? Can we all agree there was no need to discus secret back-channel communications two months before the inauguration? Can we all agree, by requesting campaign documents it appears some Senate Repblicans may have finally realized they need to push back against Mr. Trump? Can we all agree, things were pretty quiet when Donald Trump was off twitter and his staff could manage his message? Can we all agree the victory of Montana’s new GOP representative seems to prove Trump’s claim that he could murder someone in the middle of Midtown and no one would care? Here’s a guy who assaulted a reporter and voters still elected him and the House doesn’t even care. Can we all agree whatever the Senate comes up with on healthcare reform will have a tough time passing that chamber but an even rougher time in the House? Can we all agree, it’s probably not a surprise that Hillary Clinton is going after Mr. Trump, but when she’s joined by John Boehner you know the President has a real problem? Can we all agree Mr. Trump’s plan to quickly find a new head of the FBI is stymied by his own actions? Can we all agree any notion that the swamp is being drained should be put to rest when the White House releases the lobbyist waivers it has granted in order to fill government positions? Can we all agree the swamp is now a water hazard for the Professional Golfers Association? Can we all agree it would be tough to prove any Russian influence on any president other than Mr. Trump? Can we all agree Michael Flynn’s decision to fight a congressional subpoena stands in stark contrast to former campaign chief Paul Manafort– although both men will probably face criminal charges? Can we all agree, the Supreme Court is facing some weighty decisions that will test it’s political independence? Can we all agree touting an approval rating that is among the lowest of any new President is not smart politics? Can we all agree the Senate’s newly approved sanctions on Iran may be counter-productive? Can we all agree the contrast between Mr. Trump’s visit to Europe and that of former President Obama could not be more dramatic? Can we all agree the budget office report on the GOP health plan was just about what everyone expected? Now the Senate can officially reject it. Can we all agree, it takes a lot for the press corps to feel sorry for Sean Spicer, but Mr. Trump managed to do it this week when he excluded the devote Catholic from his meeting with The Pope? Can we all agree The Pope was a master of ‘not-so-subtle’ messaging in his choice of gifts for Mr. Trump? Can we all agree Sean Hannity is learning the real implications of fake news? Can we all agree the British response to leaks from the investigation of the Manchester bombing was much milder than what Mr. Trump might have said if the situation was reversed? Can we all agree Mr. Trump’s cabinet secretaries, Betsy DeVos, Scott Pruitt and Ben Carson, continue to display an uncommon lack of understanding about what most Americans want? Can we all agree all sides of the debate seem to agree Mr. Trump’s budget is dead on arrival, but he has managed to frame the debate so we will wind up with the lesser of two evils? Can we all agree the downgrade of China’s credit rating will do little to affect their position as a center of world commerce? Can we all agree Mr. Trump’s contined embrace of Philippine President Rodrigo Duterte is, in some ways, more troubling than his admiration for Vladimir Putin? Can we all agree the US may finally pay attention to what’s happening in Turkey, now that an NBA player has been accused of being a terrorist? Can we all agree no one seems to care that the Carrier jobs Mr. Trump claimed to have saved are now moving to Mexico? Can we all agree Melania seems to feel that same way about her husband as most Democrats? Two of the more depressing stories of the week for Democrats: one GOP Congressman found support still strong in his district and what Trumpcare might look like based on the problems in Iowa. And, once again, the deterioration of the nation’s moral fabric was on full display with 2 murders in Oregon and an ugly scene aboard an airplane. Anyone hoping to make the long romantic drive up Route 1 along the California coast is apparently going to have a long wait. Can we all agree if there’s one person who should be able to recognize, a nut job it’s Donald Trump? Unfortunately, James Comey is not one. Can we all agree revelations that the probe into Russian influence in our election, has now reached the White House, is only a surprise to one person? Can we all agree Mr. Trump’s Thursday characterization of the investigation as a ‘witch hunt’ ring a bit hollow this weekend? Especially since it appears he knew Michael Flynn was under investigation before he was appointed to a top White House post. Can we all agree Robert Mueller’s appointment to lead the Russian influence investigation seems to have bi-partisan support, but is worrying to observers who are more concerned with fact finding than criminal prosecution? Can we all agree, many Baby Boomers will have a sense of deja vu when Mr. Comey testifies before Congress, as we remember the start of the Watergate hearings, which began this past week in 1973? Can we all agree Mr. Trump’s arrival in Saudi Arabia has the nation on edge, as we wait to see how he will embarrass us on the world stage? Can we all agree, only Mr. Trump can ban Muslims from entering the US and then flip-flop by claiming to be their strongest supporters when he visits their countries? Can we all agree the victory by ‘moderates’ in the Iranian election proves there may be some semblance of Democracy in that ancient civilization? Can we all agree Trump has managed, once again, to prove President Obama right, when he signed the nuclear deal with Iran? Can we all agree instability in Brazil, destabilizes all of South America? Can we all agree the removal of Confederate statues in New Orleans may mark the end of an era for some, but it’s really only another step along the long road to racial equality? Can we all agree as soon as the GOP figures out the Trump Presidency cannot be saved they will push to have him removed as soon as possible to avert the disaster that will be the 2018 elections? Can we all agree the fact that security guards working for a foreign country can attack US citizens exercising their rights to free speech, without a word of condemnation for our own government is unbelievable? Can we all agree Mr. Comey and Hillary Clinton appear to have at least one thing in common – a desire to avoid a Trump hug? Can we all agree, news that foreign diplomats are providing special favors to Ivanka Trump in an attempt to reach her father, are exactly why she should not be an advisor? Can we all agree. internet providers are reacting cautiously to the FCC’s decision to relax net neutrality regulations because they know the rules can be overturned by the next administration? Can we all agree Emmanuel Macron is disappointing those on the left with his conservative cabinet appointments in France? Can we all agree the choreographed praise for the late Roger Ailes cannot overcome the more popular characterization of him as a sexual predator responsible for perverting US journalism and giving us Donald Trump? Can we all agree one response to changes Education Secretary Betsy Devoss seeks, might be to make every public school a charter school? Can we all agree it’s easy to see why Mr. Trump finds such comfort in meeting with foreign dictators since he longs for the kind of power they wield – such as arresting journalists? Can we all agree, It would be nice to think the EPA will pay attention to the outpouring of public support for enviromentail regulations, but it’s doubtful Scott Pruitt will even care? Can we all agree the most entertaining story of the week was either Mr. Putin’s offer to supply his own account of the Russian Foreign Minister’s meeting with Mr. Trump or the details of how the session was arranged? Can we all agree when they write the eventual history of the Trump administration, the last two weeks will be a major focus? Can we all agree, you know health care is an issue when it reaches the Miss USA Pageant? Can we all agree the world is eager to believe this week’s cyber- attack on the world’s computers, came from North Korea? Can we all agree Mr. Trump’s incompetence is making it possible for North Korea to continue nuclear and missile testing? Can we all agree the hack of numerous computer systems around the world will, once again make us all rethink our reliance on the internet? The US has only seen minor impact, but experts say it’s only a matter of time. Can we all agree, when you change your story four times in three days, at least three of the excuses for firing the director of the FBI must be lies? Can we all agree it is amazing that no one on the President’s staff realized firing the FBI chief might touch off a controversy? Can we all agree the mental image of press secretary Sean Spicer hiding in the bushes to avoid reporters, may be one of the more enduring images of the week and it’s hard to believe SNL and Melissa McCarthy will let it pass unnoticed? Can we all agree Mr. Trump may have more in common with Mr. Nixon than he wants if he is forced to produce the ‘tapes’ he alluded to in his tweets? In case you forgot, Nixon’s tapes forced his resignation. Can we all agree Donald Trump’s ego would make his Twitter threats laughable if he were just a developer in New York, but as President, he doesn’t even realize the implications? 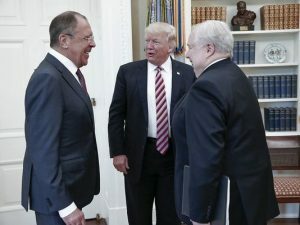 Can we all agree demanding loyalty over honesty should be an impeachable offense, since it clearly suggests Mr. Trump wanted to impede the FBI investigation into his campaign’s ties to Russia? Can we all agree canceling the White House press briefings would hurt the President more than the press, given the daily leaks that spring from the White House? Can we all agree anyone who believes Mr. Trump’s financial ties to Russia only come from his Miss Universe pageants is naive or delusional? Can we all agree Jeff Sessions’ move to increase sentences for drug offenses is racist? Can we all agree Mr. Trump’s panel on voter fraud is a fraud from the start? Can we all agree Mr. Trump needs to decide if he wants to be a President or a TV critic? He will not win a war of words with anyone on television. Can we all agree that with all the internal politics going on most of us may not have noticed the decisions to arm Kurdish fighters in Syria or send more American troops to Afghanistan? Can we all agree using immigration officers to combat drug gangs. particularly when so many are US citizens, seems a bit extraordinary? Can we all agree the Homeland Security chief’s plan to curtail the cash-for-visa program used by the Kushner family to fund luxury condos, will not happen? Can we all agree the US public barely blinked an eye when the Russian Tass News Agency was allowed to cover our President in the White House but US media ws barred? Can we all agree Sinclair’s purchase of Tribune Media has some ominous implications? Can we all agree our negotiator in chief seems to have swapped a trade deal for Far East security and security was not the winner? Can we all agree the strong dollar has increased travel to Europe by 26%, but tourists may have a rude awakening when they come home with their laptops packed into their carry-on bags? Can we all agree, acting FBI Chief Andrew McCabe and former acting Attorney General Sally Yates were the only heroes in Washington this week? Too bad the same cannot be said for Assistant Attorney General Rod Rosenstein. Can we all agree, as the Trump administration continues to destroy the environment, at least three GOP Senators deserve credit for standing up to him? Can we all agree Education Secretary Betsy Devoss really has no clue why she is facing so much opposition? Can we all agree the most under-covered story of the week might be the resignation of the head of the US Census Bureau? Can we all agree, when a cabinet secretary praises police for jailing a reporter doing his job we have really entered a new era of press relations? Can we all agree Senate leader Mitch McConnell has no regard for the Constitution or his role as a check on executive branch abuses? Can we all agree naming a committee of 13 men to write a health care bill that could drastically change women’s health care is absurd? Can we all agree Speaker Paul Ryan’s defense of his health care bill is no less despicable than McConnell’s actions? Late-night host Jimmy Kimmel had a great response to the GOP as did voters at Republican town meetings. Can we all agree this Republican Congressman’s statements on health care could become the Democratic anthem for the 2018 election cycle? Can we all agree, the Democratic race for the White House in 2020 has heated up and California’s Kamala Harris seems to have her running shoes on? Can we all agree, were it not for the Comey firing we’d all be talking about subpoenas for Michael Flynn and the White House’s 18 day delay in firing him? Can we all agree elections in France, Germany and South Korea seem to suggest that the rest of the world has learned from our mistake? Can we all agree anyone who has purchased organic produce from outside the US has always wondered about the validity of the label. Can we all agree our political debate over the next two years will be shaped by this week’s House vote on replacing the Affordable Care Act? Can we all agree that if your own Senate colleagues have already decided your bill is not worth considering, you might have a problem convincing the public that it was a good piece of legislation? Even, late-night host Jimmy Kimmel tried to warn the GOP. Can we all agree if the House bill were ever to pass the Senate we should be able to claim stress from the election of Mr. Trump, as a pre-existing condition? Can we all agree, this might be one time when the money spent by the insurance lobby will have a beneficial impact on public policy? Can we all agree the weekly drip, drip, drip of stories about the Russian connection to the Trump campaign will make governing difficult for the administration? Can we all agree we hope the French will learn from our mistakes and ignore the hacks into their election and elect the moderate, Emmanuel Macron? Can we all agree, the Democrats need to stop blaming FBI director James Comey, for their November defeat? Without their own mistakes, the election would not have been so close that Comey’s action made a difference. Can we all agree the major news of the week should have been the approval of a 5-month budget plan that rejects almost every principle Trump has put forward and may lead to a government shutdown in September? Can we all agree free speech is under attack in this country and no-one seems to care? Can we all agree the happiest community in the country is probably Palm Beach, FL, now that Donald Trump has decided to make his New Jersey golf club his weekend vacation home? Either way the rest of us foot the bill. Can we all agree there might be something wrong with the White House vetting process as they continue to see nominees withdraw from consideration, because your own party sees them as unqualified? Can we all agree, gutting the office of the nation’s drug czar, might be a tough sell in states where the opioid epidemic is killing thousands each year? Can we all agree EPA chief Scott Pruitt made the right move in recusing himself from court battles over climate change, but we’re pretty sure his subordinates will know what he wants them to do? Can we all agree the new employment numbers only show that it took 10 years to recover from the excesses of the last Republican administration? Although the troubling numbers from the auto industry might suggest some issues ahead. Can we all agree the debate over immigration was never more obvious than the differences in public policy in California and Texas? Can we all agree North Korea’s criticism of China might make them feel good, but it will do little to alter the balance of power in the region? 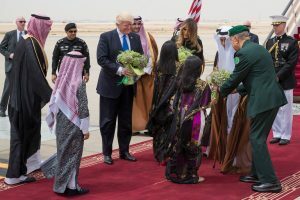 Can we all agree Mr. Trump’s proposed trip to the Mideast has disaster written all over it – particularly his stops in Muslim countries whose residents no longer feel welcome here? Can we all agree the various descriptions of the phone conversation between Mr. Trump and Russian Leader Vladimir Putin make you wonder if they were on the same call? Can we all agree that, once again, the government is mishandling the water crises in Flint, MI, and hoping the rest of the nation will not notice? Can we all agree, Boston Red Sox officials did the right thing in banning a fan for life because of his racial slur directed at an opposing player? Can we all agree, the Administration’s order allowing religious organizations to venture into politics could be a boon to the Democrats if African-American church leaders support their candidates. Evangelicals seem to be deserting Mr, Trump in droves over his climate change policies. Can we all agree Prince Philip is entitled to retire from public life – at 95? The Queen will apparently carry on at 91. Can we all agree it’s about time Facebook and other online services realize that an unedited stream of fake information does not make the world safer? Can we all agree the change in leadership at the Heritage Foundation will benefit conservatives in the long run? Can we all agree, speaking of remaking an institution, the changes at Fox News, may have a broader impact on US politics than we realize? Can we all agree the Trump family, including the President and Ivanka, have proven once again that there is no room for ethics in the White House? Can we all agree, inviting the Supreme Court Justice to the White House for lunch, could be the dumbest idea the administration has ever floated? And they already have a pretty long record of dumb ideas. Can we all agree the departure of Sebastian V. Gorka from the White House should be celebrated only if he winds up outside of government entirely? One 7-year-old’s response to a Trump supporter.